It was a lovely morning. Even so, the warmth from the effort of grinding coffee beans was most welcome. 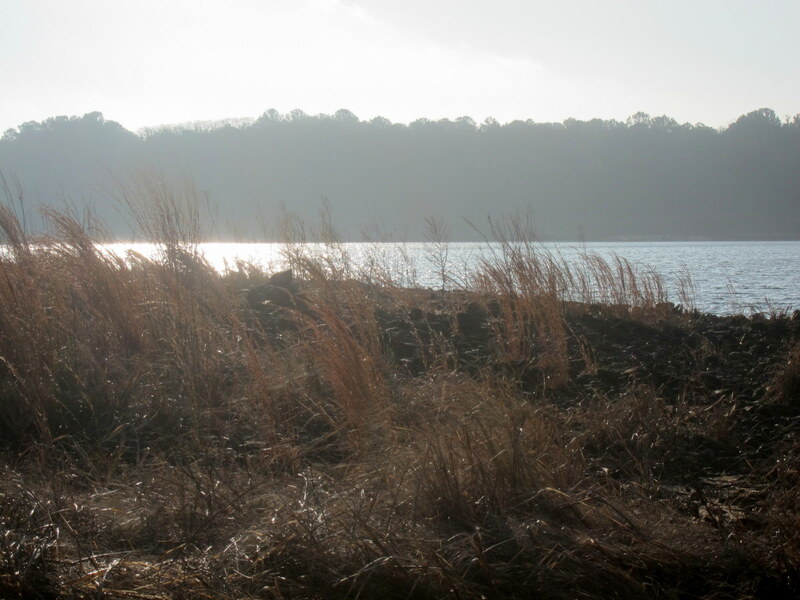 The wind blowing off the lake was rather blustery and cold. Originally, the plan was to camp in a place more protected from the wind, but that didn’t work out, and getting settled in camp turned out to be more of an adventure than anticipated. Arrival at the campsite wasn’t anticipated to be after dark. And this wasn’t the campsite anticipated. 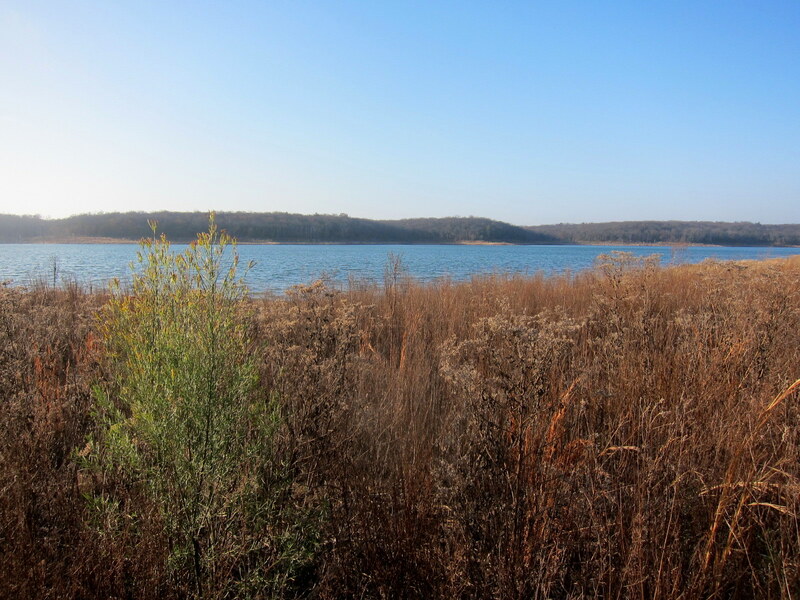 The plan was to return to a general area within the Culp Branch Native Prairie that I had visited many months ago. But it was much more brushy, the sun had already set, and it was difficult to find a desirable spot to set up accommodations. 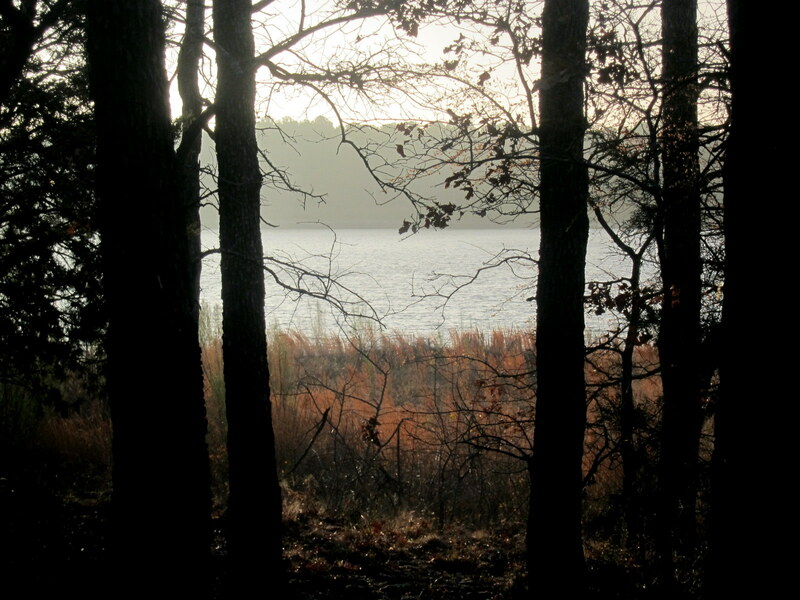 Since it was getting dark fast, the original plan was abandoned in favor of the Isle Du Bois State Park fall-back. The only problem was how to escape from brushy wilderness in the dark. Fortunately, memories of my prior visit allowed recovery of the single track trail and eventually finding the exit as the pre-moonrise darkness engulfed me. The additional 5 miles were covered without incident. A campsite was selected based on a vague recollection of a general area and the presence of suitable hammock holding trees. Setting up camp in total darkness took longer, but there was no rush. A mild breeze blew all night, punctuated by several more intense gusts. 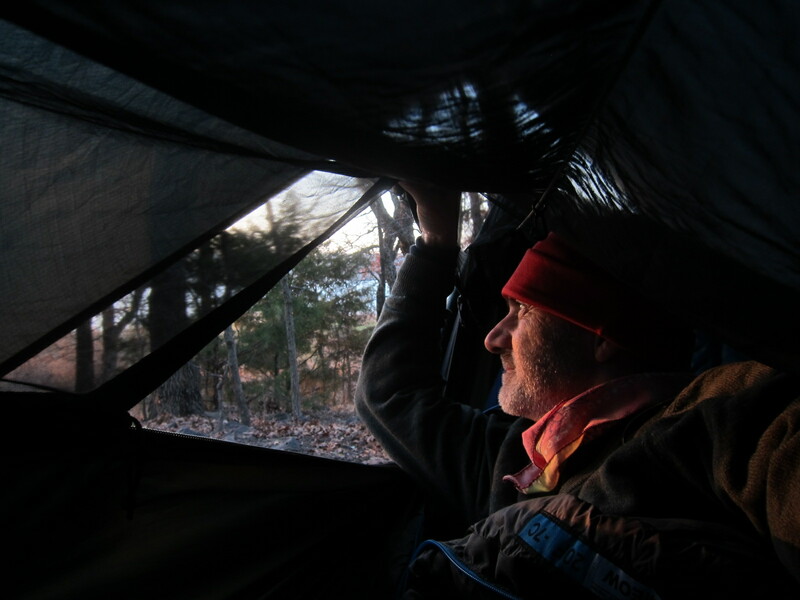 Every location my sleeping bag touched the hammock directly, seemed to have the heat my body generated stripped away. Fortunately, my windbreaker and gloves (in addition to my Thermorest pad) were available to minimize cold spots. Periods of no sleep allowed time to ponder how nice an underquilt might be. But morning came at last, and the sunrise was cheery. 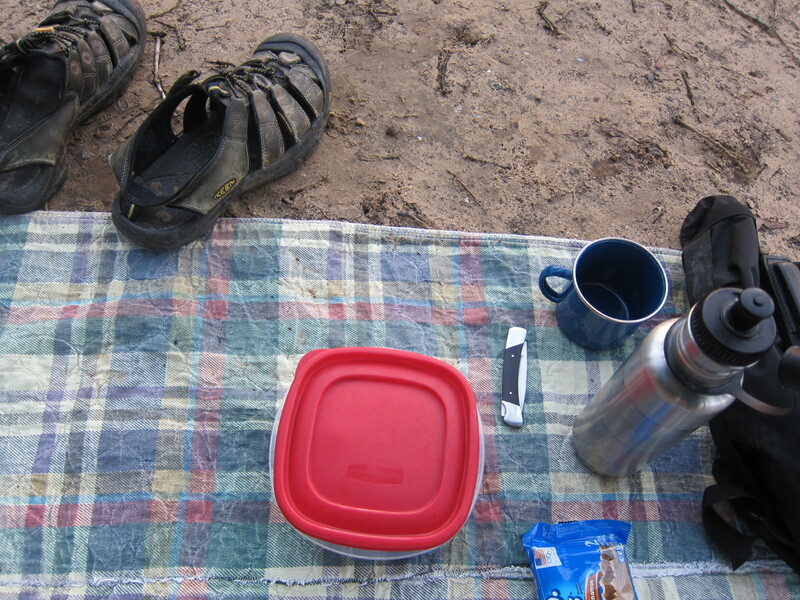 Part of breakfast was consumed within the comfort of my sleeping bag. 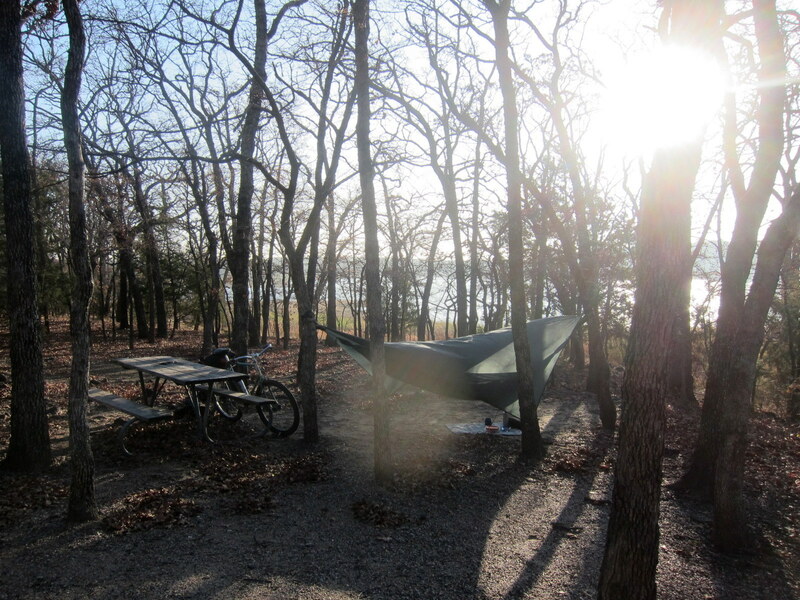 An attempt was made to orient the hammock parallel to the wind to minimize exposure. It seemed to work fairly well. After breakfast part one, it was time for a short walk around. The theory is that a little early morning exposure to a chilly wind will make fresh coffee even better. Theory confirmed during breakfast part two. 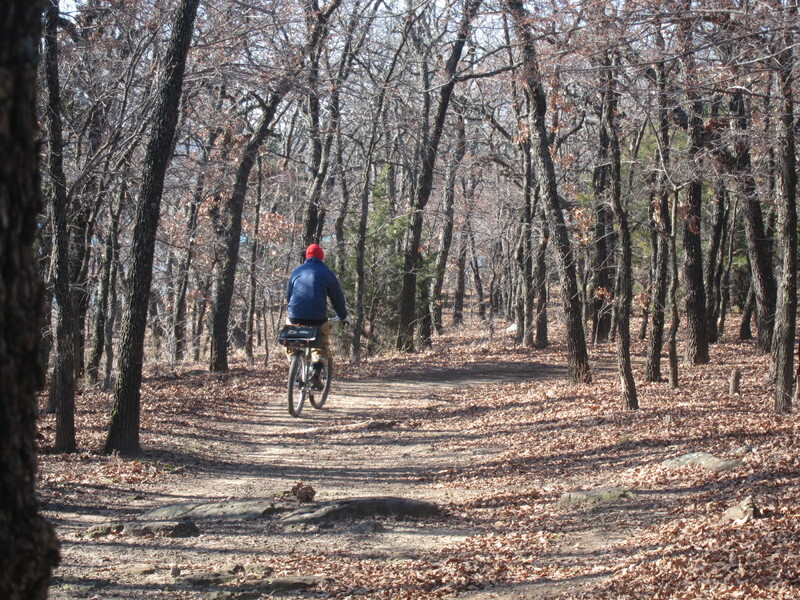 After breakfast is a great time to pedal the unloaded bike on trails within the campground. When the playtime ended, the bike was packed up for the return trip. 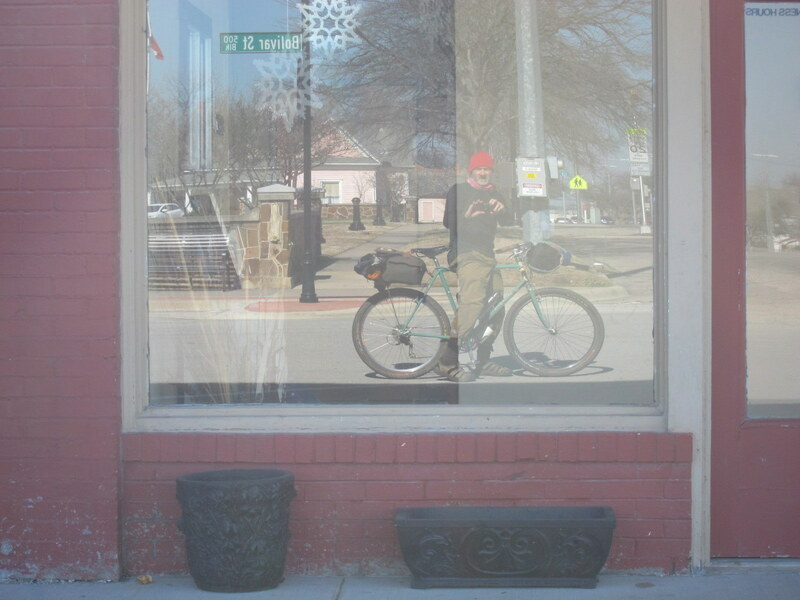 A brief pause in downtown Sanger. Sometimes, when the light is right, those storefront window reflections catch the eye. Almost home, pondering the fact that overnighters were accomplished in each of the first two months of this year. Will the trend continue? Great post. Really like the photos, Looking forward to seeing if you can make this a monthly thing. Thanks! All the cool kids are making a run at the “one in each month” goal. Since I prefer my adventures “civilized”, I don’t know if I’m that cool. 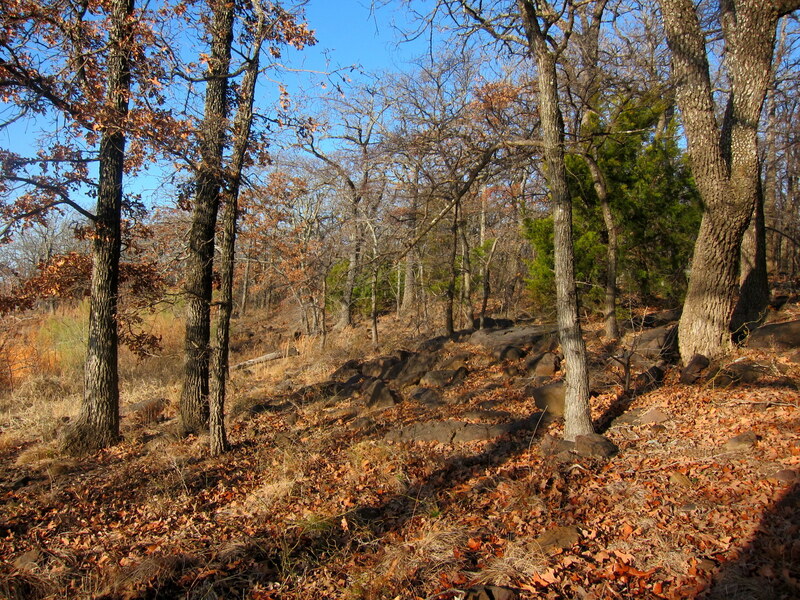 The bare trees & brown ground cover definitely say “winter”. 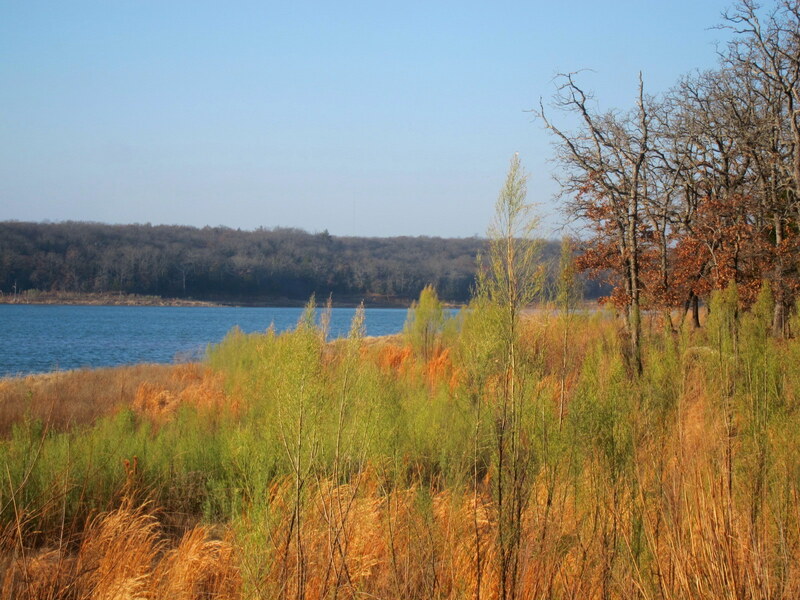 It would be interesting to re-visit a spot where you get that bare trees look in winter, then photo in spring & summer for contrast. By the way, what is the front bag on the Atlantis? 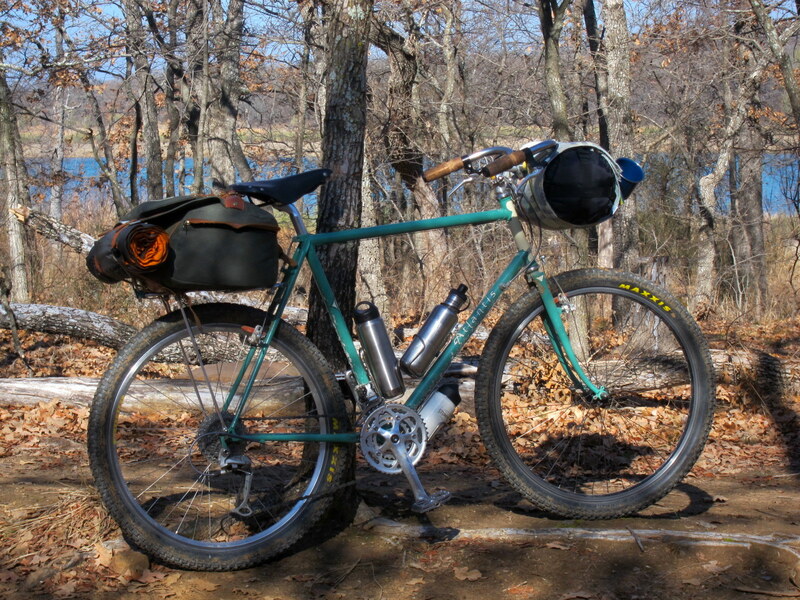 I’m currently mulling over handlebar mounted bags. Not really a bag, Doug, just my sleeping bag rolled up in a small ground pad I use for sitting, then strapped to my bars. I saw reasonable weather for February and went for it. Hopefully you’ll have similar good luck. That first photo of you greeting the sunrise from your hammock says loads! 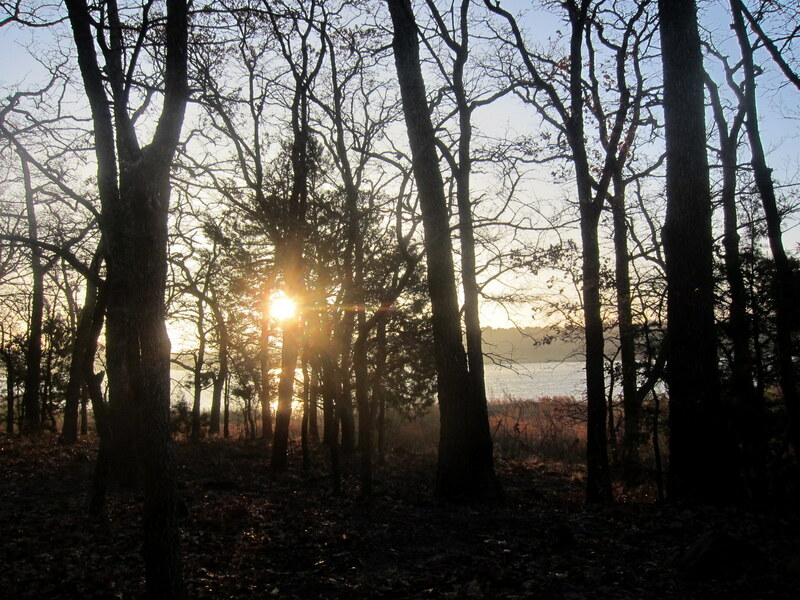 For setting up in the dark, and a little directionally disoriented, my sunrise view turned out to be spectacular. I have yet to do as S24O, but it always looks like fun. I have to admit that, not being a fan of urban camping, I just find the distances involved in reaching a campsite kinda put me off. Hmmm…good point. 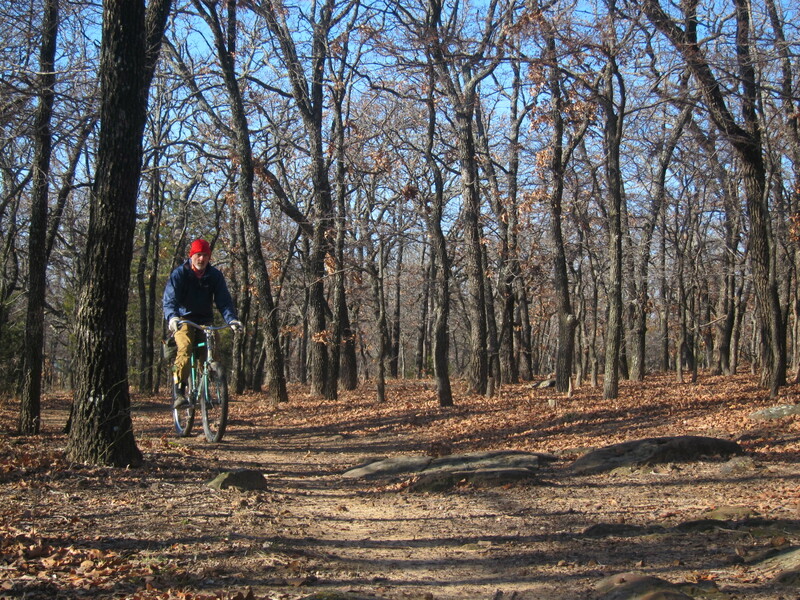 My trips are a bit repetitive because there aren’t many options, but at least I can reach a nice state park within an hour and a half of pedaling. I’d enjoy seeing how you’d do an S36O. I love reading your blog. It’s always wel written and interesting. Out here in Oregon and elsewhere, some of us are doing a yearly challenge #BikeTourR12 where we are doing a bike tour each month. You should include yours as well. Russ made a Flickr group where you can post pics. Here is a link to info. I still need to do my Feb. tour. Have fun and happy touring! Thanks for the kind words. Yes, I’m familiar with Russ’ challenge and have that in mind as I consider 2015 goals. I’ll consider documenting on Flickr and Instagram. Maybe that’ll inspire me to really make it happen. I have to agree with graveldoc. That picture speaks to me. It makes me want to get out camping as soon as possible. 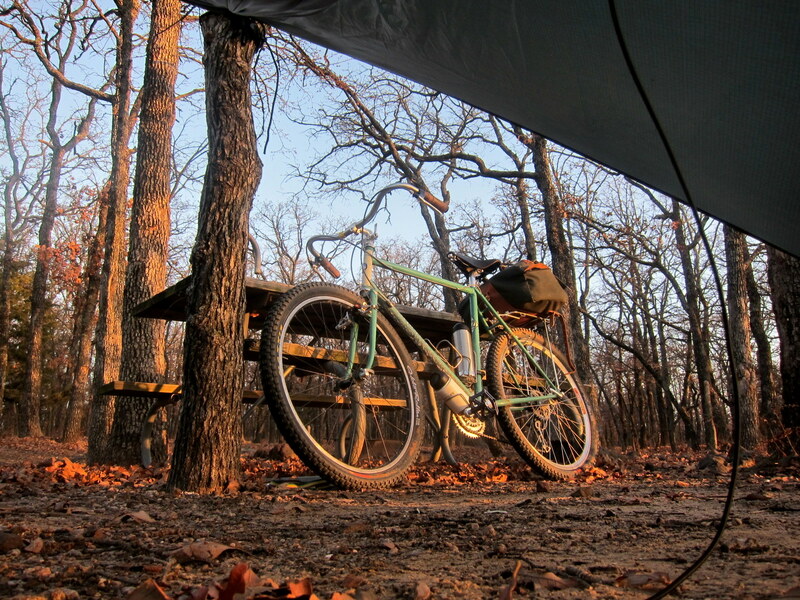 I have yet to do a winter S24O even though I am an experienced winter camper on foot. Thanks. I hope you get out there and photo document the trip. That would be fascinating to see. 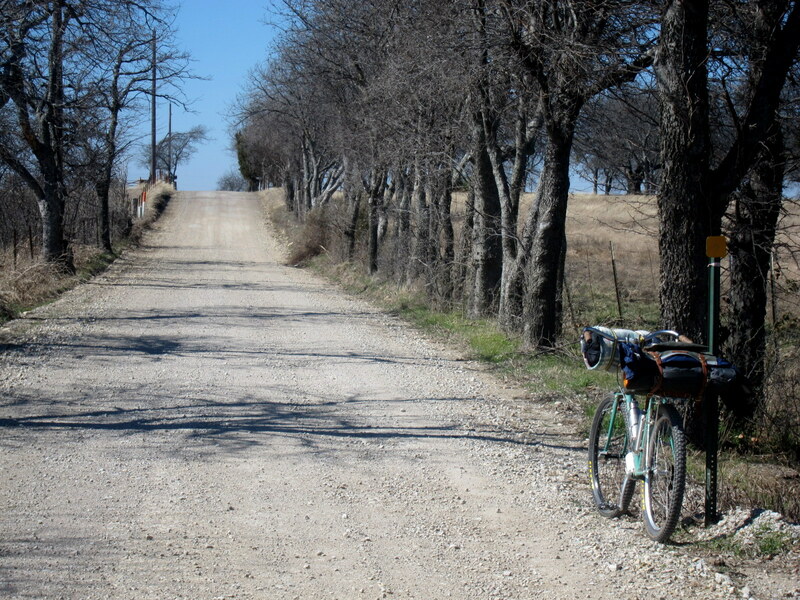 Nice photos of the S24O, Chris. Thanks, I’m not proud of my poptarts habit, but can’t deny it. Hoping for your input. I can’t have both; A. Homer Hilsen or an Atlantis? 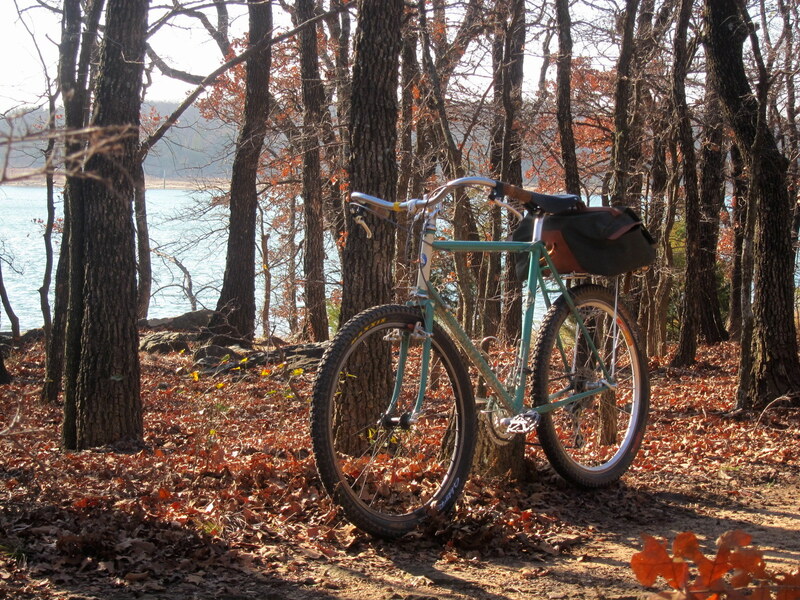 I like canti’s, I prefer 650b tires, I’m going to build it with drop bars…….. What’da’ya think? Just my opinion, but unless you need fatter tires or need to carry camping loads often, go with the Hilsen. 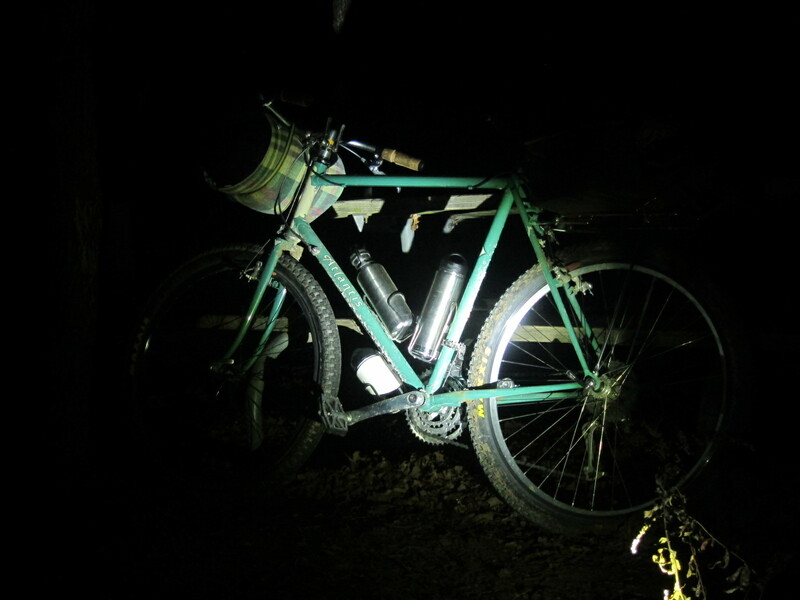 For me the Hilsen does everything I want…from snappy unloaded road rides, light loaded day rides and brew-ups, and the occasional overnighter. I have a QB because I like riding fixed sometimes, and I have an Atlantis because I thought I’d like a fatter tire, off-roader. I am fortunate. I could be pretty happy with any one of them as my only bike, but if forced to choose, I’d probably pick the Hilsen. It seems to cover my range of typical rides the best. Maybe the best question for you is what features you want to add to what the Cheviot already offers? Exactly! And I’ve thought about it that way. 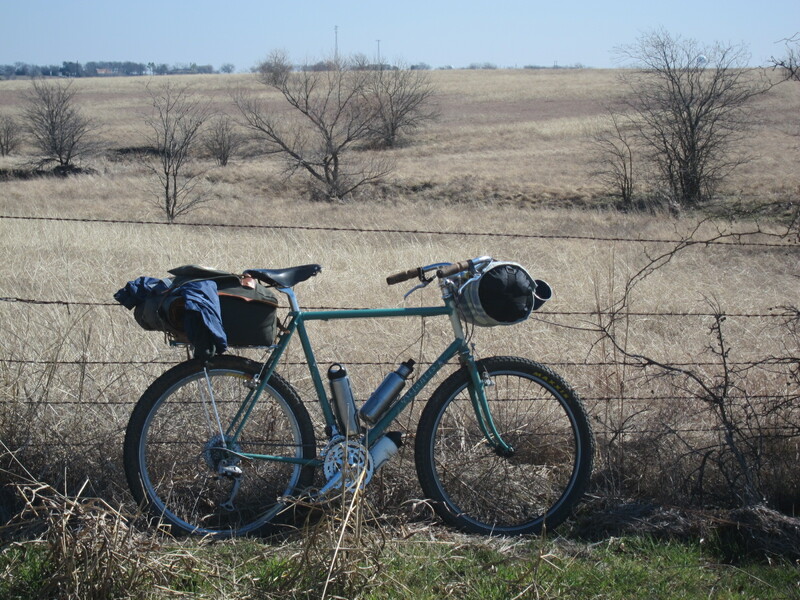 My Cheviot with the Rock and Roads can pretty much take me anywhere. With basket and Carradice, plenty of space to pack things up. So I was looking for more of a road bike. But good news! I’ve just scored a used Saluki! Fantastic! I saw the RBW group conversation on that and wondered if you might strike a deal. Can’t wait to see it! Great trip! Glad to see someone is braving the winter chill. We still have snow on the ground up here so it will be several more weeks before my camping gear sees daylight. Consult question: I am an experienced self-contained tourer looking to build a lighter kit for S24O’s. I am looking to build a solid, light(er) weight kit based around a solo tent. For me, durability and ease of use trump weight savings. So, I am looking at a Trangia 28 cookset, solo-freestanding tent or hammock, etc. I have no interest in “suffering” for a few ounces of weight savings. Right now I am stuck on coffee. It seem you may have some small affinity for coffee. Have you any preferences/thoughts among the various options for getting from already ground beans and water to the nectar of the Gods? I currently use a filter basket robbed from a defunct coffee maker which happens to fit perfectly inside my Trangia 27. But, it won’t fit in a T-28 or in a GSI Kettle. I note your GSI collapsible basket and Kettle in this trip. I have seen you use the Kettle before but don’t recall the collapsible basket. You have also used a press a time or two. I think you might even have a picture of a filter bag string (like a tea bag) in one of your posts. I don’t recall if you’ve used a permanent filter (like an MSR Mugmate style). So, any thoughts on the various coffee making equipment options out there….speed, ease of use, cleanup, portability, taste, hassle, etc.? Wow, what a question! A thousand things come to mind, and I ponder writing a separate blog post on this topic alone. Many words, many photos. But the result of all that blathering would simply be further confirmation that I’m a freak with questionable judgment. So in an attempt to maintain my grand reputation as a top notch “Leisure Consultant; specializing in bicycles, hammocks, and coffee outside”, I’ll just provide the final conclusion here. I have a wide variety of coffee toys, and I enjoy playing with them. 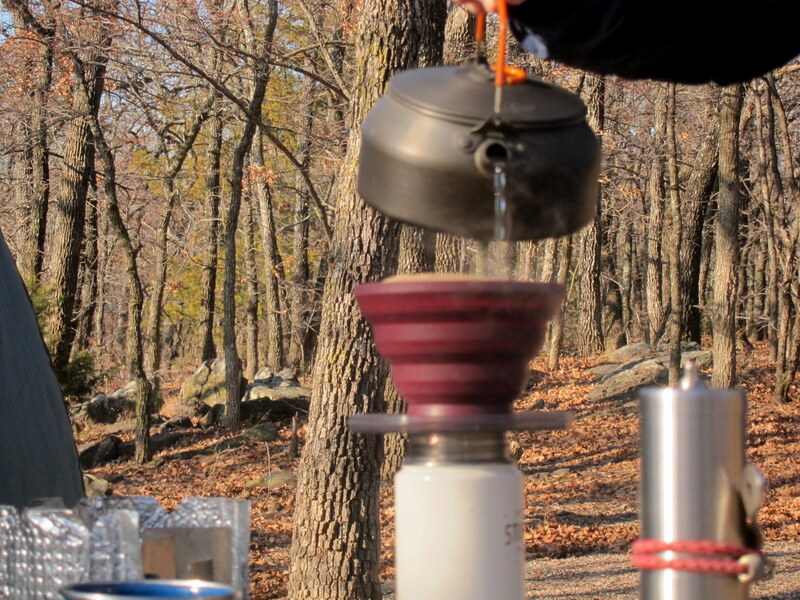 When playing outdoors, it usually comes down to AeroPress, Bialetti Moka Express, and pour over cones. I alternate between them primarily based on what toy I want to play with on a given day. To my taste, each of the methods produces a wonderful (but distinctly different) result. 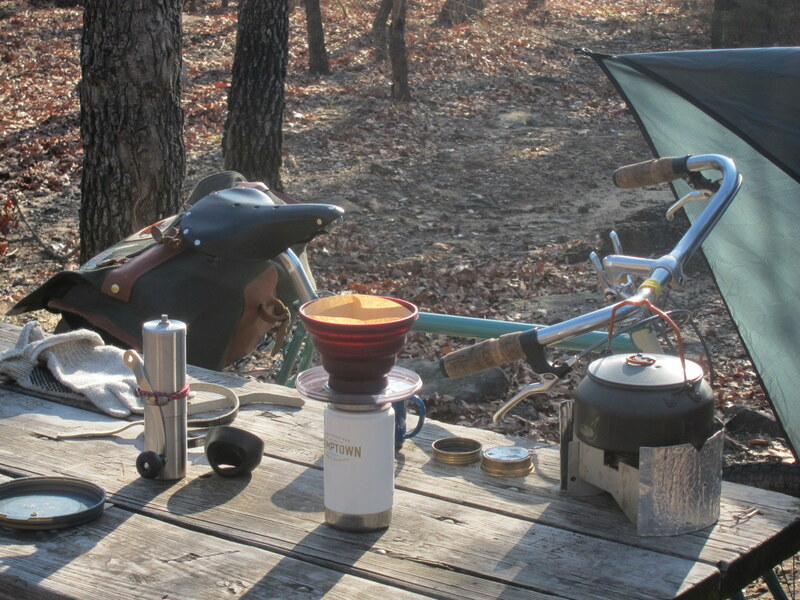 Because the very purpose for coffee outside is leisure and slowing down, speed doesn’t enter into to it at all. Because I ride steel bicycles with racks and luggage, portability isn’t really an issue either. I have plenty of luggage for any coffee toys I have. Ease of use? Again, not the point. An electric drip coffee pot plugged into the wall in my kitchen is easy to use. For me part of the point is “playing” with them. Think about a camp fire. They aren’t easy or efficient, but to some of us they are delightful and worth the effort. Cleanup? I don’t even think about it. I think I just rinse each of them with water. Really, it just comes down to what I want to “play” with that day. Since I have two pour over cones, I’ll go ahead a point out some minor differences between them. The GSI cone is larger, made of plastic and rubber, compresses flat, and works fine. The Soto Helix cone is smaller, lighter, made of spiral stainless steel, compresses flat, and works fine. To me it seems like the Helix loses some heat, and sits lower in the cup which can require attention to make sure it drains completely (unless you use an oversized cup), so for me it works better for summer outings when I want to travel light. I’ve probably already said enough to call my judgment into question. But if I missed something important to you, please let me know. Thank you. I’ve been tempted to buy an AeroPress but haven’t pulled the trigger. Mostly because I don’t know what I would be buying. They look fairly indestructible and appear to have much poorer flying aerodynamics than paper filters. But, my concern is cleaning the “filter thing” (not sure what it is called) in the press. To my uninitiated eye, it looks a lot like the top of an old percolator basket flipped upside down basically shoves the grounds into the bottom of the cup. How much water do you actually need in real life to clean your AeroPress? ….Not looking for “immaculate clean” but just “camping clean” if you know what I mean. Are we talking a fling and a gentle squirt or two from a water bottle? Or, do you need to find your trusty spork to shovel the worm dirt from the bottom of the cup then hit it with half gallon of high pressure water? I think your readers would likely appreciate a post (or two) about your coffee equipment. I certainly would. I read many of your posts about your hammock and they definitely helped me decide among the various smaller shelter options available. Grand reputation or not, you really are a consultant on this stuff! No need to hammer out a reply here…I’ll contentedly sit back with a cuppa and anticipate a post on the subject. After what is shown in the video, you can rinse a little if you wish. I do a more thorough cleaning at home occasionally.